No need to go anywhere to enjoy this dish. 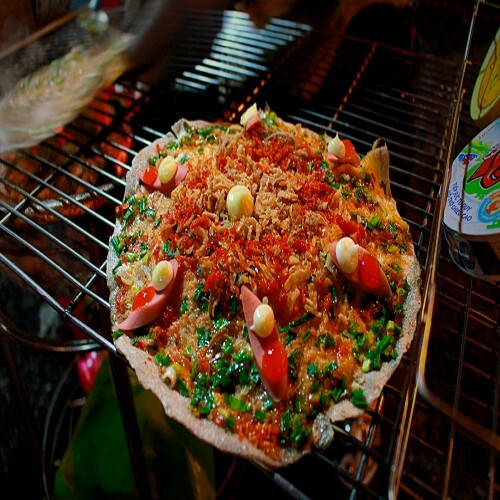 You also can make Vietnamese Crepe (Bánh Xèo Việt Nam) at home. 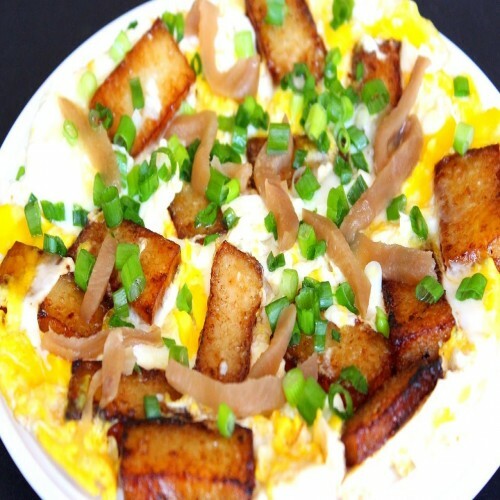 It is not only tasty, but also really easy. Today,I would like to introduce this one for all you guys. 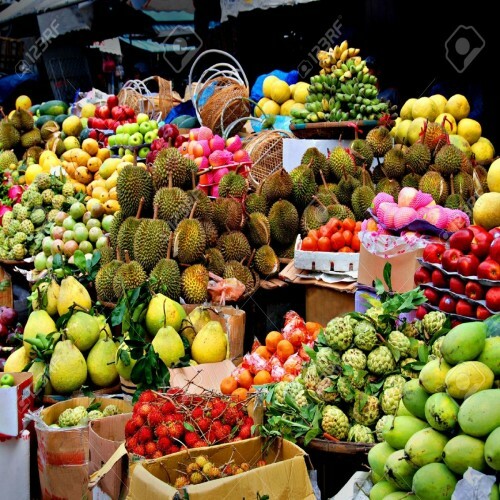 If you are a gourmet about Vietnamese Food, I think you should not miss it. Weekend is arrived, making and enjoy it with family and friends is a great idea. 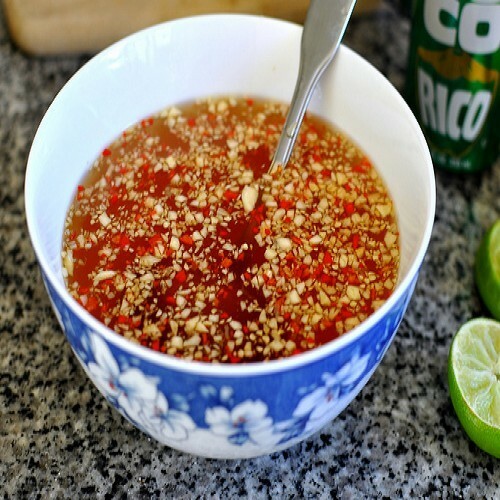 So, are you ready to create one of Vietnamese Recipe like this one for your party in weekend? 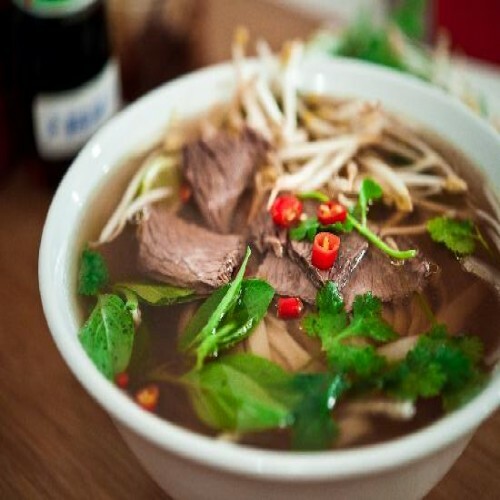 Trust me; if you want to enjoy the true specific flavor of Vietnamese Food, here is one of great options. Now, let us start cooking, ok? Step 1: Clean mung bean in water for 2 – 3 times. Soak in warm water about 2 hours and bring to steam until it is cooked. Step 2: Peek off the cover of shrimps, pull out the black lines on their backs. Clean with water added a little salt. Step 3: Use a small pot, add 1 teaspoon oil and fry minced garlic until it is fragrant. Next, add more shrimps and fry quickly in 2 – 3 minutes. Pour on clean bowl. Step 4: Clean and slice beef thinly. Step 5: Cut off the roots of mushrooms, clean and slice into medium pieces. Clean all vegetables. Peel off the cover of carrot, clean and slice into long and thin pieces. Mix sliced carrot with 1 teaspoon salt, ½ teaspoon sugar, a little vinegar and wait about 15 minutes. Press out the water from this mixture before serving. Peel off the cover of onion; slice small. Step 6: Mix Vietnamese crepe flour with water. You should choose the flour already has coconut milk to increase the flavor for one of it. 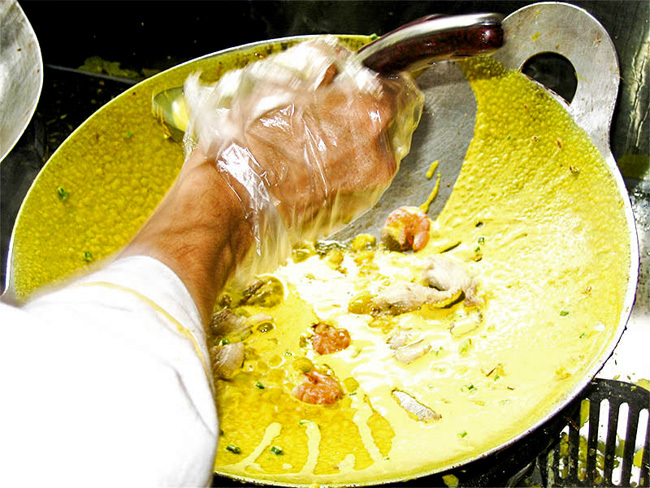 Add more saffron flour, sliced spring onion, stir gently and wait 30 minutes before making crepes. Step 7: Heat the oil (2 teaspoons), add sliced onion + mushrooms into pan and fry quickly in 1 minute. Step 8: Next, add more sliced beef. Step 9: Scoop 2 – 3 spoons mixture crepe flour in step 6. Shake and spread gently to make sure this flour will cover all face of pan and ingredients. 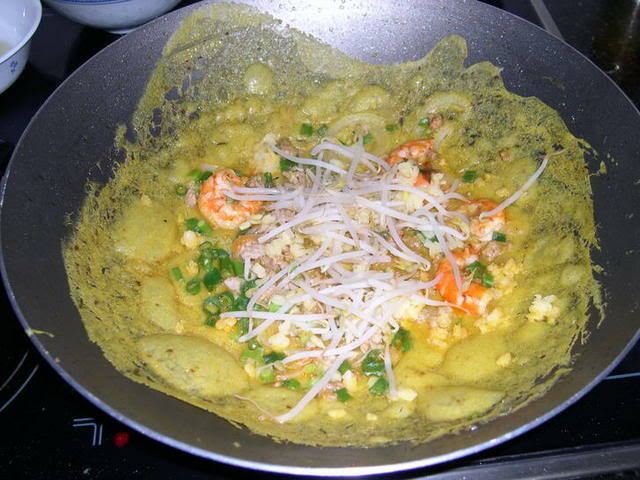 Step 10: Arrange on face of crepe some shrimps, mung bean, bean sprout and cover the pan carefully. Step 11: Fry with large heat about 3 – 4 minutes. 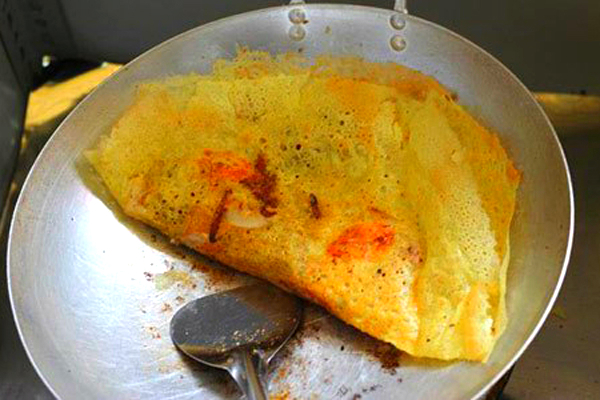 Next, use cooking shovel to fold in half and fry until you have a satisfy crepe skin. Put on plate and repeat this process until all ingredients and mixture crepe flour are out. Finally, your dish is ready served. Eating with sweet and sour sauce + sliced carrot in step 5 + vegetables is perfect. So, how do you feel? Are you happy with our Banh Xeo? Hope you will have a good appetite and Good Luck for your Cooking.